Investors are feeling pretty good these days. How do I know this? Well, over the past few months there have been multiple sentiment indicators that have come in very strong. The latest was a recent Pew Research poll that showed nearly six in 10 people in the United States (58%) think the economic situation is good. That’s a big leap from last year, when only 44% described the U.S. economy as good. It’s also the most positive assessment of economic conditions since 2007. Other recent sentiment indicators have bested expectations, including the February and March Consumer Confidence, the March Philly Fed Survey, the March NFIB Small Business Survey and the February ISM Manufacturing PMI. Then there’s the actual price performance of equities. Year to date, the SPDR Dow Jones Industrial Average ETF (DIA) is up 5.5%, while the SPDR S&P 500 ETF Trust (SPY) is up 6.1%. 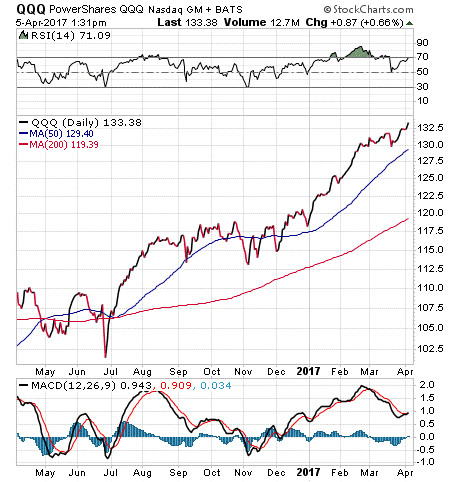 The PowerShares QQQ Trust ETF (QQQ) has spiked some 12.6%. So, what’s driving the price of these benchmark ETFs? Check that. Let’s call them “yuge” ETF inflows, as in Trump-sized inflows. According to the website ETF.com, during the first three months of this year, inflows into ETFs were $134.7 billion. Compare that figure to the relatively puny $29.6 billion in inflows in Q1 2016, and you see why “yuge” is an accurate description. Moreover, if inflows continue at their current pace, then 2017 will see nearly $540 billion flood into the market. That would crush last year’s record inflow total of $287.5 billion. It is the record pace of fund inflows that really tells us that investors are feeling good about the economy and the markets. Yes, we should worry about policy failures in Washington, the lack of hard economic data supporting this rally and the upcoming corporate earnings season. Yet investors stay on the sidelines at their own peril, as the record levels of capital coming in to exchange-traded funds (ETFs) are going to provide a significant bid higher for equities. You might even say they will ensure a “yuge” gain in markets going forward. If you’d like to find out how subscribers to my Successful ETF Investing advisory service are riding this yuge market wave right now, I invite you to subscribe today! Last week was historic “across the pond,” as Britain made “Brexit” official by invoking a provision in European law known as Article 50. Britain’s European Union (EU) ambassador formally triggered what is likely to be a two-year process of the United Kingdom extricating itself from membership in the EU. And the Brits did it in characteristically subtle fashion by simply handing a letter to EU Council President Donald Tusk. For investors here at home, the official Brexit trigger does have implications for specific exchange-traded funds (ETFs) pegged to Europe. Over the past several weeks, our ETF Talk segment has features several European ETFs, and one reason why is because I am bullish on this market segment. However, the Brexit situation does pose a few things to think about when assessing which European ETFs might be best. To get a better sense of the pros and cons of European ETFs, I turned to my friend and colleague Tom Essaye of The Sevens Report. Tom is pretty much an expert at all things markets, but he has a particularly interesting read on Europe. Like me, he’s bullish on the segment and for the same basic reasons. First, there is compelling relative valuation in European equities vs. U.S. stocks. Second, there continues to be central bank support from the ECB, which is using “easy” monetary policy vs. the Fed. Finally, the political risks of investing in Europe, in my view, have been far too overstated. Valuation wise, Tom explained to me that the S&P 500 now trades at the top end of historical valuations. The S&P 500 is trading at 18.25 times 2017 earnings per share (EPS) and 17.75 times 2018 EPS. Conversely, the MSCI Europe Index is trading at 15.1 times 2017 earnings and 13.8 times 2018 earnings. That’s a 17% and 22% discount to the U.S. valuations. As for central bank support, the ECB is still doing quantitative easing (QE), and it still plans to buy some 60 billion euros worth of bonds through December of this year. That will continue to support the EU economy, and help earnings and inflation move higher, which is European-equity positive. On the political risk front, people have overreacted to Brexit and the potential pitfalls that could befall European equities due to political instability. I am not saying there isn’t reason for caution. However, there seems to be too much trepidation on the part of some investors when it comes to putting money to work in Europe. So, what is the best way for investors to get long in European equities? Although there are many great funds to choose from, Tom and I are partial to the ETF that we featured in a recent ETF Talk, and that is the Wisdom Tree Europe Hedged Equity Fund (HEDJ). There are a couple of primary reasons for the HEDJ preference. First, if you believe, as I do, that the U.S. dollar is going to appreciate over time vs. the euro, then you want the currency hedge that HEDJ offers. Second, HEDJ is by far the most-liquid European currency hedged ETF out there. And, for those who are concerned about any possible Brexit exposure and its negative influence on British stocks, you’re in luck, as HEDJ has virtually no British exposure (just 0.37% of holdings). Apparently, the smart money agrees with Tom and me, as HEDJ was up nearly 9% in just the first three months of the year. If you’d like to find out more about how to profit not only in Europe, but in U.S. stocks, bonds, commodities and countries around the world with a proven plan that’s been working for investors for 40 years, then I invite you to check out my Successful ETF Investing advisory service, today! When it comes to novelists, there is no one I like better than Ayn Rand. And, when it comes to philosophers, well, Miss Rand also is atop my list. In this quote, the “Atlas Shrugged” author warns of the dangers of following others, and how that can lead to personal and societal disaster. It is the same way for your money. While it’s great to get sound, proven advice from smart people about the markets, it’s also incumbent upon us all to think for ourselves. So, accept responsibility for your life, do your homework and never let your course be prescribed by a leader… unless that leader is you. Investment expert Jim Woods shares the details on this largest single-country European fund that focus on Germany equities.